Hunter Focus Review – Will it Really Boost Your Brain? Home » Reviews » Hunter Focus Review – Will it Really Boost Your Brain? There’s a fresh face in the nootropics market – Hunter Focus. Boldly identifying itself as a premium product, it’s clear from the off that this supplement is trying to sell quality and differentiate itself from the rest. Every element of this nootropic looks clean-cut, smart and modern. But you know what they say, never judge a supplement by its packaging. It’s evident that Hunter Focus is marketed towards the affluent, ambitious individuals among us. It’s been presented as ‘the’ nootropic supplement for those juggling a busy family life, a high-intensity job and a challenging fitness plan. All of this makes Hunter Focus sound like a powerhouse supplement designed to not only support your brain health, but also enhance your successful lifestyle too. We want to know how it performs when put to the test. Let’s see how it does. The truth of just how well this supplement can benefit you and your life goals as a woman can be revealed in an in-depth Hunter Focus review. As we review, we keep the needs of women in mind too. This product is quite clearly targeted towards a male audience, however it may still benefit female consumers too. Due to our hormonal make up, we’re more susceptible to the symptoms of stress, and a good nootropic for women should be able to help with that. Hunter Focus claims to help you perform at your best across all areas of life. They say it will give you a mental edge, improve your ability to learn, enhance your attention span and increase productivity overall. On first glance, we’re impressed with the supplements label. An initial look at the dosages confirmed that this is one of the most generously dosed nootropic stacks we’ve seen. On top of that, we already recognize a number of the ingredients as being extremely potent and backed by scientific research. To find out how well these premium ingredients perform, we need to see how well each one does in the eyes of science. We’ll be looking for research to prove each one provides nootropic benefits you can rely on. Once we know that, we need to ensure Hunter Focus is completely safe. To do this, it needs to be free of proprietary blends and made up of entirely natural ingredients to deliver a clean experience, without side effects. The ingredients should also be dosed based on scientific research to ensure both safety and effectiveness. The final stage of our Hunter Focus review is to assess the value of the product. We do this by comparing the cost of the supplement to the benefits you should expect from it. This allows us to get an idea of whether Hunter Focus is a smart purchase, or a waste of cash. Throughout this review, we’ll be using our collective experience and expertise to bring you truly insightful knowledge on whether this nootropic really can boost your cognitive function. Read on and find out how Hunter Focus performed under review. How much is Hunter Focus? The main selling point of Hunter Focus is that it will improve you brain power. But, without a little know-how, experience and scientific research, it can be difficult to define exactly what that means. Luckily, we’ve got you covered. Ingredients within Hunter Focus will strengthen the signals between neurons, that allow them to work together. This has been shown to improve your memory and your ability to recall information. By strengthening these signals, you can also expect an enhanced attention span and a heightened ability to learn new things. In a real-life situation, the combination of these two elements will help you excel in projects and improve your overall output at work. Several ingredients in this formula also promote the regeneration and repair of brain cells. They can also protect these important cells and improve plasticity. Science shows this will make you feel sharper and calmer for longer. Many find this useful in high-pressure situations where you need a level head. Lowering stress levels is essential for women when opting for a nootropic stack. Hunter Focus does this via a number of different methods. Increased plasticity and boosted alpha waves both lift overall mood. By encouraging the release of essential hormones within the brain, you’ll also be able to combat the symptoms of stress with ease. Research shows us that this supplement has what it takes to increase the feeling of calm alertness that helps you work under pressure. You might describe this feeling as being ‘in the zone’, but on a cellular level, this is down to the boosted alpha brainwaves from the widely supplemented amino acid, l-theanine. To establish if Hunter Focus is safe to use, we need to have a look at the supplement facts. By studying the ingredients closely, we can ascertain more than just their effectiveness. Researching and analyzing Hunter Focus’ supplement facts revealed that it’s safely dosed, based on science. We also discovered that every ingredient is entirely natural, which reduces the risks of side effects significantly. 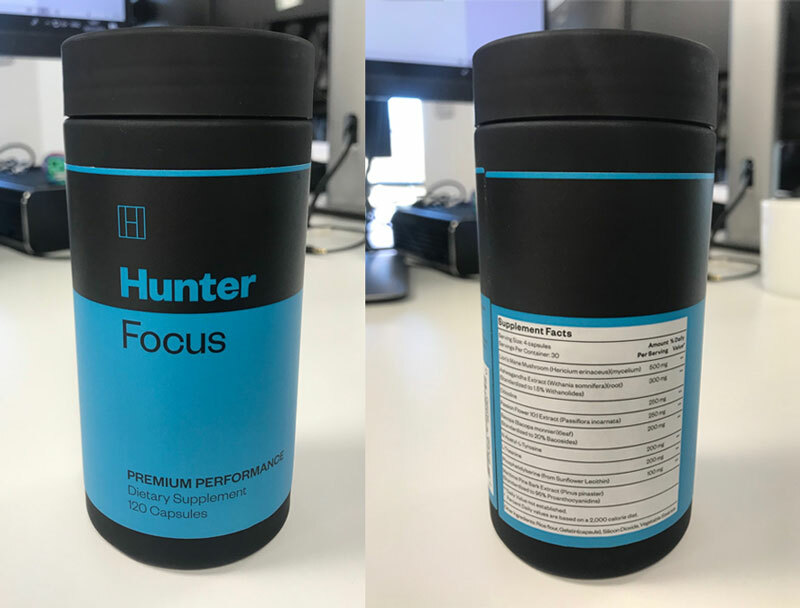 Most importantly, there are no proprietary blends in Hunter Focus. This means this whole nootropic is entirely transparent, without any guesswork when it comes to what’s in it, how much and how it could damage our bodies. We recommend that you do not use any nootropic to treat an existing illness. Please speak to your physician before you decide to supplement with Hunter Focus if this is the case. Hunter Focus contains just nine ingredient and we found each one to be entirely natural, highly-researched and entirely reliable. The lower number of ingredients in this supplement is important, as it tells us a little more about the dosages. With four capsules a day and only nine ingredients, you can be sure of a potent formula rather than an overfilled, ineffective mix. This is the most generously dosed ingredient in the Hunter Focus formula, and it’s a powerhouse in the world of nootropics. It’s been proven to release hericenones and erinacines, which then initiate the production of more nerve growth factor (NGF). This is used to help repair and protect nerves within your brain. NGF improves overall brain health and makes you sharper. Lions mane has also been proven to promote brain plasticity which is linked to improved memory and learning ability. On top of that, this versatile ingredient has been shown to combat the feelings of stress. Taken from the root of the ashwagandha plant, this has been widely used as a nootropic for years. Research into the effects of the extract has revealed that it has a direct impact on the repair and renewal of axons and dendrites within your brain. This results in improved memory and recall. It has also been shown to improve your choline levels in your brain, which results in lifting your mood and boosting motivation. We found research that showed cortisol, the stress hormone, was reduced by almost 30% when the test subjects supplemented with ashwagandha extract . Within the body citocoline splits into two compounds, choline and cytidine. Both of these have been proven to help to nourish the brain and take cognitive power up a notch. Choline is converted into acetylcholine, which works with other ingredients to improve the strength of signals between neurons in your brain. This gives your memory, attention span and ability to learn a boost. When ingested, cytidine is converted into uridine, which works to repair and protect the cells and nerves within your brain. This extract plays an important role in increasing gamma-Aminobutyric acid, or GABA levels within your brain. This is a neurotransmitter that regulates the communication between brain cells and your nervous system. Research shows that this can affect you by reducing stress levels and help you sleep better. GABA supplementation has been used widely to help relieve feelings of stress and anxiety and even to reduce the symptoms of premenstrual syndrome. As such, we’re happy to see this GABA producing nootropic within the formula, as it makes Hunter Focus even more appropriate for women. Passion flower has also been shown to promote the release of dopamine . This results in a better mood and improved focus. When ingested, Bacopa releases bacosides A and B. Once in your body, science has shown they can improve the way you deal with the symptoms of stress. This helps you respond in a more calm and controlled way, reducing the feelings of anxiety. These bacosides also work alongside the other ingredients to further shore up the strength of the signals between neurons. This will result in improved mood, focus and ability to learn. 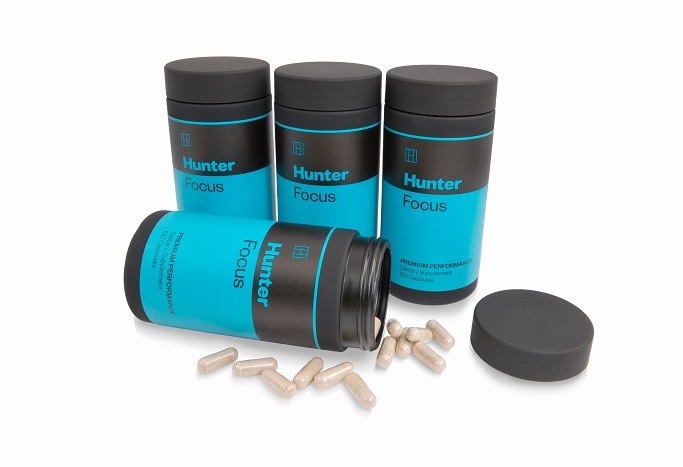 The dosages in Hunter Focus are generous, therefore it’s essential you take them correctly. Both to get the most out of them and to ensure overall safety. The manufacturers suggest you take two capsules twice a day with a large glass of water and food. Hunter Focus is made up of some powerful nootropics, so it’s essential you find the ideal time to take them. If you take them at the wrong moment you may not experience the best brain boosting benefits you expect from this supplement. When it comes to a nootropic, consistency is the key to success. If you don’t take them regularly, you won’t feel the best possible benefits. Science has shown that, for many ingredients long-term supplementation of some of these ingredients is the key to maximizing results. A container of Hunter Focus provides 120 capsules, which equates to 30, four capsule servings. The people behind Hunter Focus do offer a deal whereby, if you buy three containers of the product, you get a fourth for free. This may help you save money, as nootropics work best over time. So, it’s worth considering if you decide to opt for Hunter Focus as your long-term nootropic. On the outside, this may look like it’s designed to cater for men alone, but our Hunter Focus review found it to be a comprehensive formula that works wonders for women too. The formula delivers on all fronts, providing a sharper mind, improved memory, enhanced learning skills and heightened cognitive power. On top of that, it helps to reduce the impact of stress on the mind, which is essential when it comes to finding a nootropic for women. Hunter Focus is also completely safe, well dosed and free of side effects. It also doesn’t contain any proprietary blends, making it a transparent and reliable formula. The issue we’ve found with Hunter Focus isn’t with the supplement itself. The price is our main concern. We know that the cost can make all the difference between picking a quality product and opting for something less effective. However, after a close review of Hunter Focus, we believe this supplement is still worth the money. After scouring the market, we’re yet to find a better nootropic supplement and we think you’d struggle to discover something more effective. Despite the premium price, we think it’s well worth the money.